Tuesday 23rd April is St George’s Day in England, celebrating St George, England's patron saint. The anniversary of his death, which is on April 23rd, is seen as England's national day. According to legend, he was a soldier in the Roman army who killed a dragon and saved a princess. The flag of England is the red Cross of St. George, and this is widely displayed as a symbol of national identity. Surprisingly, 23rd April is not a Bank Holiday. William Shakespeare - long revered as Britain's, if not the world's, best known author and playwright, also died on 23rd April, but in 1616, in Stratford-upon-Avon, making this the 403rd Anniversary. He was Baptised in Stratford on the 26th April 1564 and his birth date is not known but it is traditionally observed on 23rd April, Saint George's Day, indicating that he would have died on his birthday. This date, which can be traced back to an 18th-century scholar's mistake, has proved appealing to biographers, it being considered somewhat poetic that he died on his 42nd birthday. Shakespeare has 37 plays and 154 sonnets credited to him, but we don't really know whether he actually wrote them, or was just a merchant, land owner and occasional actor who either brokered the plays or was prepared to be acknowledged as the author to protect anonymity of those truly responsible. Certainly writing plays could be dangerous as any plot seen to reflect a political plot not appreciated by the Queen/King could be interpreted as treason. Many scholars argue, quite reasonably, that proof of Shakespeare’s authorship is largely circumstantial and sketchy at best; certainly he was better known in Stratford as a businessman [one documented view is that he brokered the plays] and not a playwright. Monday 22nd April is Easter Monday, which is Bank holiday in the UK. As mentioned in an earlier Blog, whereas the Easter celebration in the UK is based on the Gregorian Calendar, the Orthodox Easter celebrations are based on the Julian Calendar. This year that places Orthodox Easter a full week after the UK Bank Holidays will take place. In Egypt, the ancient festival of Sham El Nassim (literally meaning "smelling of the breeze") dates back to Pharaonic times (about 2700 BC) although it is celebrated on the Coptic Easter Monday, which aligns with the Orthodox Easter (so this year on the 29th April). It's not seen as a religious festival as it's a National Holiday for both Egyptian Christians and Muslims. Traditional activities include painting eggs, picnicking, and eating feseekh (fermented mullet). 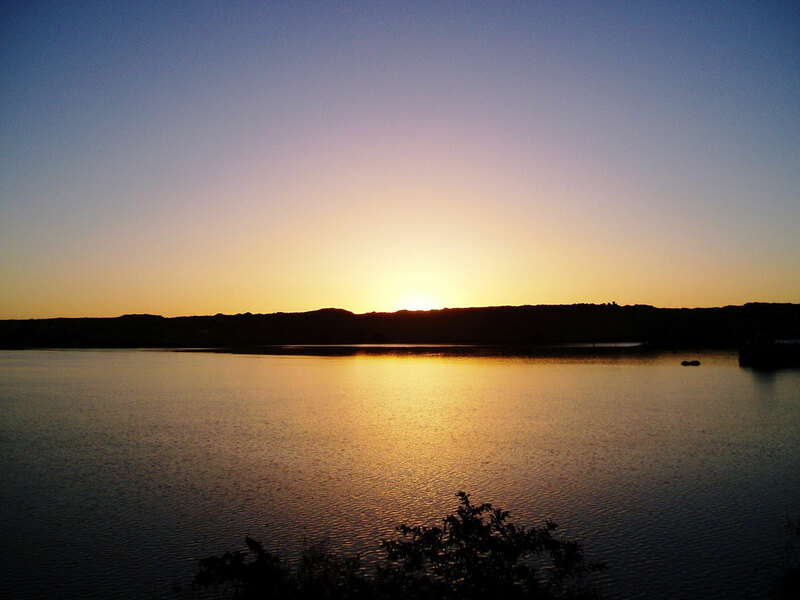 Image shows sunrise over the Nile from the Philae Temple. Monday 22nd April is also Earth Day, which is heralded as a pivotal opportunity for people, corporations and governments to join together to create a global green economy. This is the 49th Anniversary of Earth Day and it is hoped that co-ordinated efforts now will be recognized by future generations as a turning point. See EarthDay.org for further news and events in your area. This year is themed on Protect Our Species. "In nature, nothing exists alone." - Rachel Carson, 1962.As the Earth Day Website tells us: Whilst the Earth is home to millions of species, some of which still remain undiscovered, human beings have upset the balance of nature and are causing an extinction of species at an alarming rate. Climate change, Habitat loss, deforestation, pollution, pesticides, poaching and irresponsible agriculture contribute to this. Already it could be irreversible but we have to act now to minimise the far reaching damage we are causing. Check the website to see what contribution you can make to slowing down the negative impact of our species on our planet. 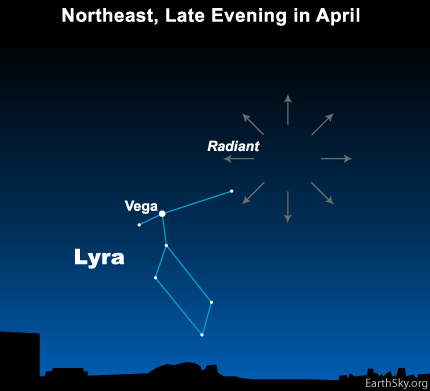 Observations of the Lyrids Meteor Showers go back over 2700 years! The Ancient Chinese are said to have recorded the Lyrid meteors “falling like rain” in the year 687 BC. Even if you can't see anything, there will be an impact energetically. 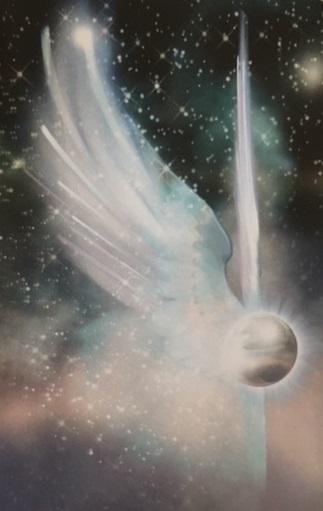 You can invoke the Angel Zikiel (Angel Guardian of Meteors and Asteroids) to help bring in new ideas. The image of Zikiel (right) is by Richard Rockwood from Angela McGerr's Heart & Soul Angel Cards. Zikiel guides the comets and meteorites in their eternal passage through space, tracking man's galactic origins; offering a visionary flash of inspiration from the Sky..
You can invoke Zikiel by calling his name three times (pronunciation = Zick ee el) and adding 'I call upon you to be with me now, 'in love & light, in love & light, in love and light'. If you have a clear quartz, you can programme it with Zikiel's name and keep it with you to help capture any inspiration thoughts channelled from the heavens tonight and also to help your heart to make the right choices. This ritual is taken from Angela McGerr's An Angel For Every Day - now out of print and in very short supply. However, But we do still have some of Angela's out of print titles (generally also personally signed by her) available via Harmony Healing Shop. Sunday 21st April is Easter Sunday, which is generally taken to celebrate the resurrection of Jesus three days after his crucifixion. Intriguingly, Easter Sunday is not a set date but is calculated according to the Lunar cycle, being the next Sunday after the first Full Moon following the Vernal (Spring) Equinox, so it can move around between 22nd March and 25th April (despite the first Full Moon after the Vernal Equinox being 26th April this year, so this is calculated according to the Ecclesiastical Calendar). This points to the celebration being linked to an earlier Pagan celebration, which were all associated with seasons and moon cycles; further corroborative evidence being the name Easter – derived from the Pagan Goddess Eostre; the Easter Egg – reminiscent of the Pagan egg to symbolise fertility and the Easter Bunny – a variation on the Pagan Hare, another ancient symbol of fertility and with a 28 day gestation period very linked to the lunar cycle. In Ancient Egypt the hare is a hieroglyph meaning ‘existence’. Interestingly, the hare has alleged associations with the alchemical symbol for tin (Jupiter/luck) and is strongly represented in ancient world mythology as having divine qualities. 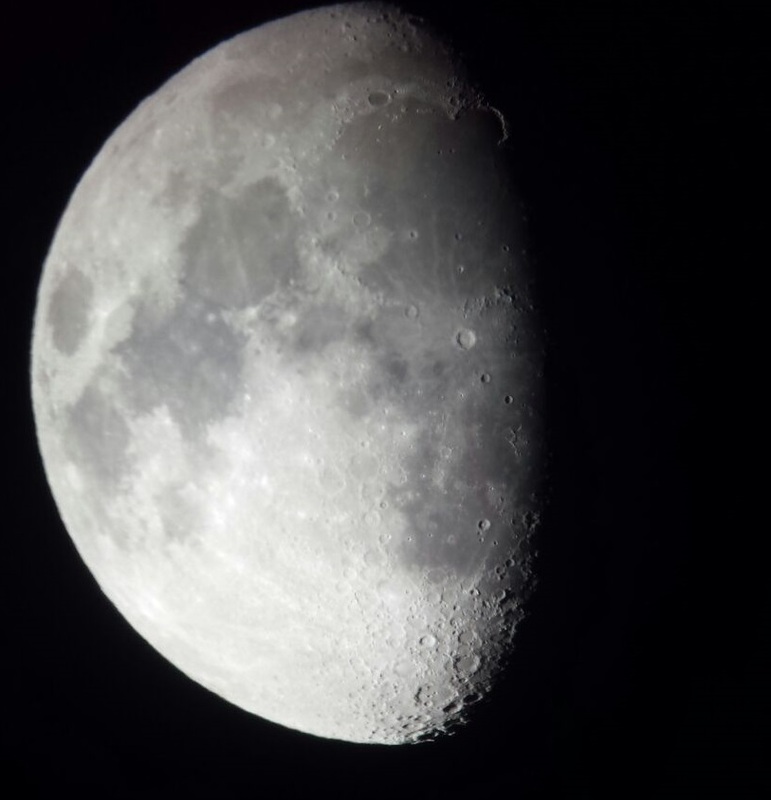 Its elusiveness and erratic behaviour, particularly at night, have reinforced its reputation as a magical creature, with mystical links to the female cycle and to the moon which governed it. Intriguingly, a famous symbol of three interlocking hares chasing each other around a circle has been found in various parts of the UK, particularly Devon, and indeed all over the world. Known as the hare triscol, only three ears are shown yet, due to clever positioning, they each seem to have two. Looking on the internet for an image to use, I came across this fabulously vibrant version by children's book illustrator Jackie Morris (link to website) who graciously granted permission for me to use it for an article I wrote in 2011 when it was the Chinese New Year of the Golden Hare (or Rabbit). I love the intense blue and the way the moon is represented as both Full and New. Simply stunning! Thanks Jackie. Anyone finding the whole hare triscol concept fascinating, might like to check out the Three Hares Project website. Friday 19th April is the Christian Festival of Good Friday, which is a Bank Holiday in the UK as part of the Easter break. Whereas the Easter celebration in the UK is based on the Gregorian Calendar, the Orthodox Easter celebrations are based on the Julian Calendar and this year that places Orthodox Easter a full week after the UK Bank Holidays will take place. Good Friday commemorates the Day when Jesus was crucified. It was not called ‘Good Friday’ until the 4th Century and may be a corruption of God’s Friday. 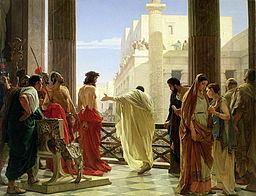 Image shows Antonio Ciseri's [Public Domain] depiction of Ecce Homo with Jesus and Pontius Pilate, 19th century via Wikimedia Commons. Sunday 14th April is Palm Sunday in the Christian Calendar this year. Palm Sunday, also known as Passion Sunday, is the 6th Sunday of Lent and the final Sunday before Easter. Traditionally it marks the entry of Jesus into Jerusalem. The name is believed to commemorate the placement of palm leaves on the road to soften the surface for the donkey on which he was riding. Riding a donkey was symbolic of a peaceful arrival whereas riding a horse may have been interpreted as inciteful since kings entering a city on horseback were often threatening war. 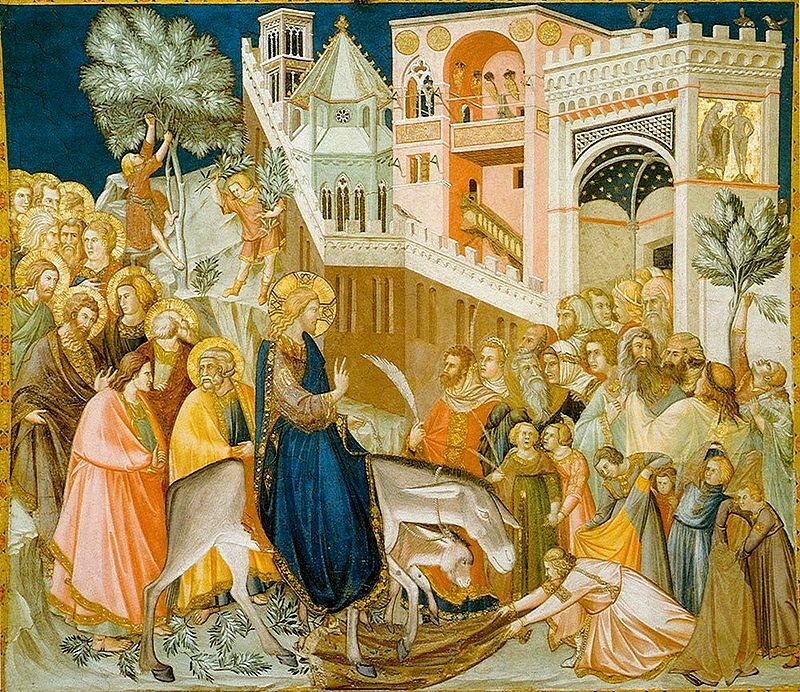 Image (above left) shows the enttry of Christ into Jerusalem, by Pietro Lorenzetti (1320), Public Domain, obtained from Wikipedia via Wikimedia Commons.